Happy Monday! It has been a snowy past couple of days, but I got to spend my Saturday having a post-holiday brunch (all day) with my friends. I miss the colors of Spring, so I added a pop of mint in my cardigan and accessories along with this nautical button up blouse. I love this top because it is versatile to layer for winter, or wear on its own for warmer weather. To tackle the snow, I wore my Hunter boots which are my go-to for the winter months. I hope you are keeping warm in this snowy weather! I know I can already use a beach vacation. 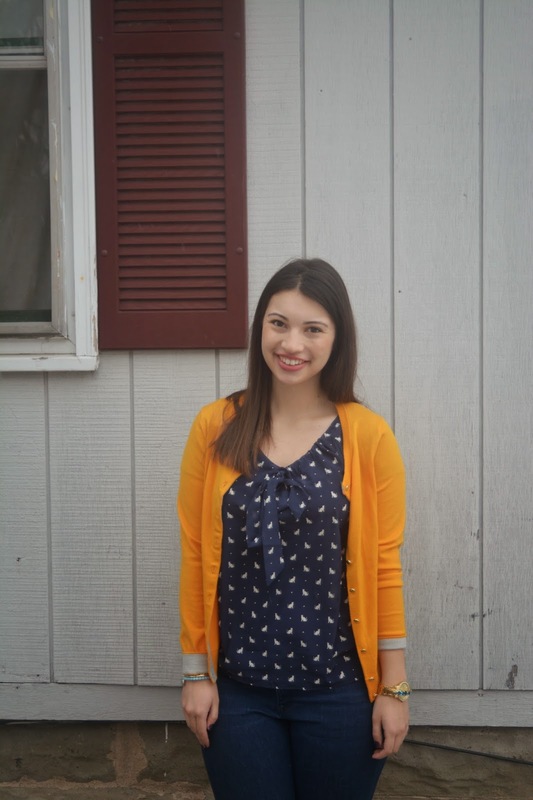 So maybe cats and cardigans aren't a classic combo, but I do love pairing gold and navy blue together in an outfit. I am not a Michigan fan (Go Bucks! ), but I like the look of this contrasting color combination. 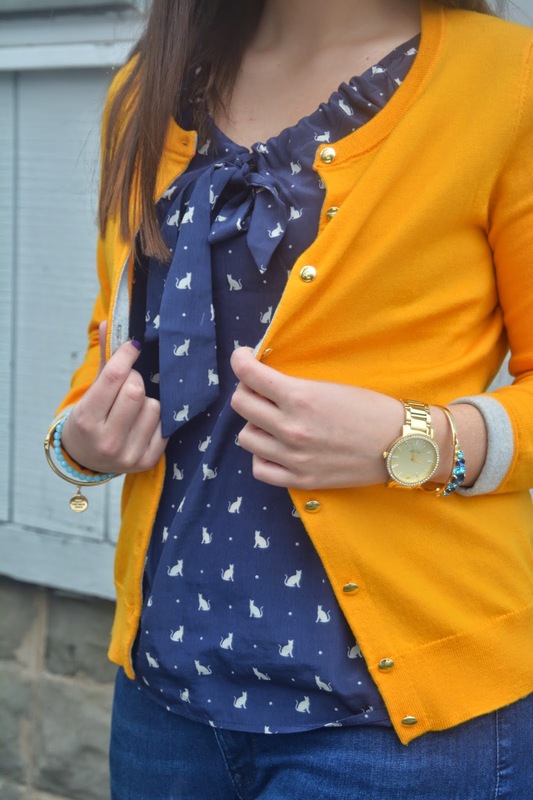 I love the adorable cat motif on this bowed blouse. 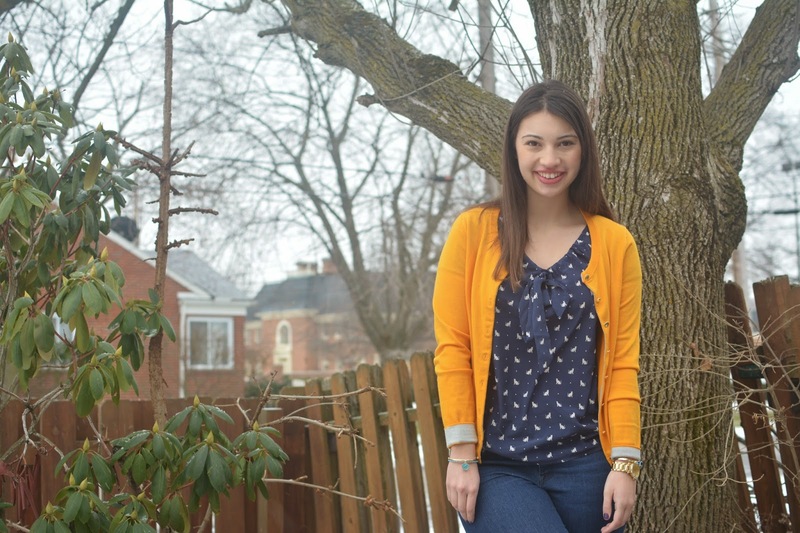 This golden yellow cardigan is from Banana Republic and my cat shirt is from Old Navy. 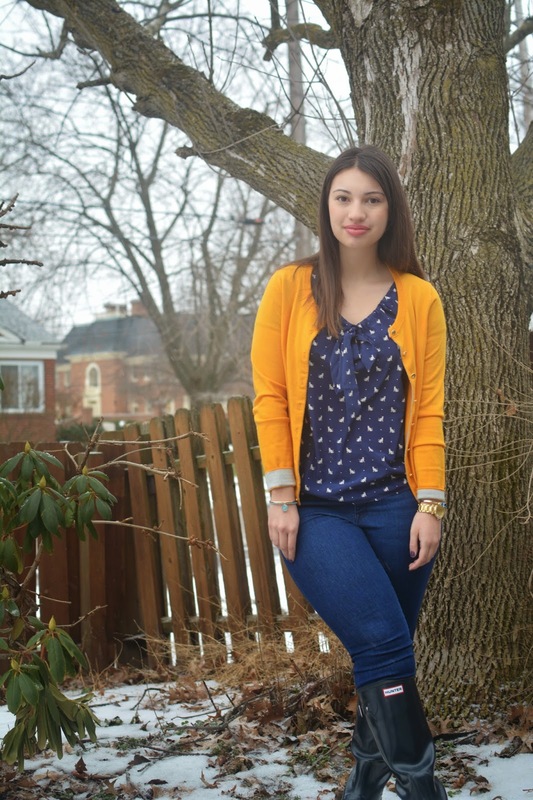 Adding a vibrant color to an outfit makes this gloomy winter weather less depressing. 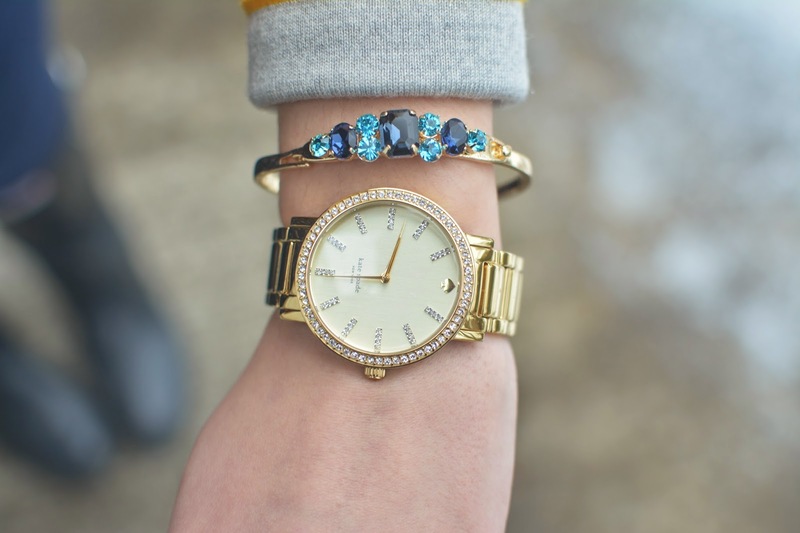 To pick up the gold detailing on the cardigan, I wore my Kate Spade watch and blue jeweled bracelet from The Limited. 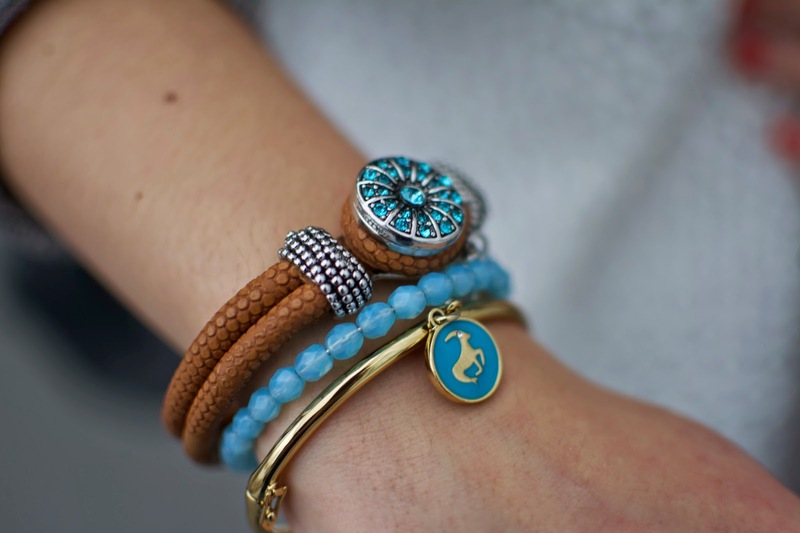 I added accents of light blue by wearing this Kate Spade Capricorn charm, and Alex & Ani beaded bracelet. 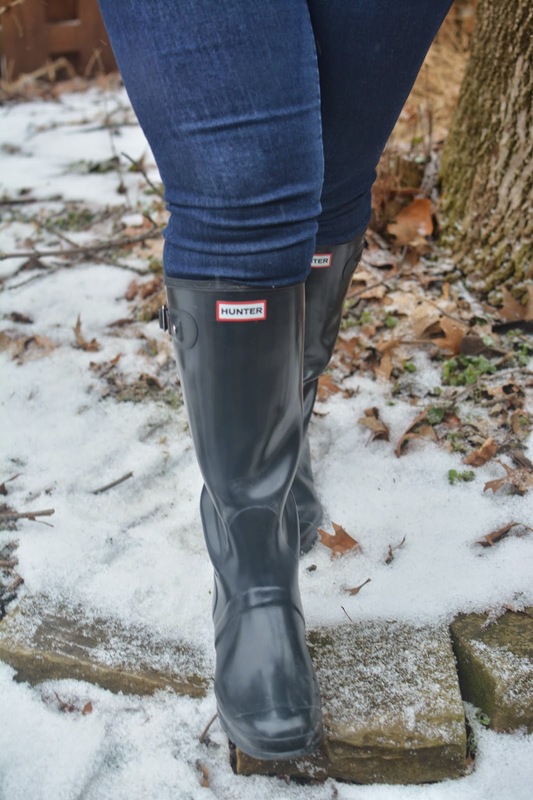 My Hunter Boots are a winter staple, and I love how this navy blue pair are both practical and stylish for the winter months. I hope you are staying warm wherever you are! I am appreciating any day that is over 30 degrees and not snowing. Can spring time be here already? Happy Monday! It has been awhile since I have posted, but I have done my best to avoid leaving the house with these arctic temperatures. I just settled back into my apartment, and am getting back into the swing of things for my LAST SEMESTER EVER. My Birthday was a week ago, which also happened to be the day of the Lilly Pulitzer After Party Sale. 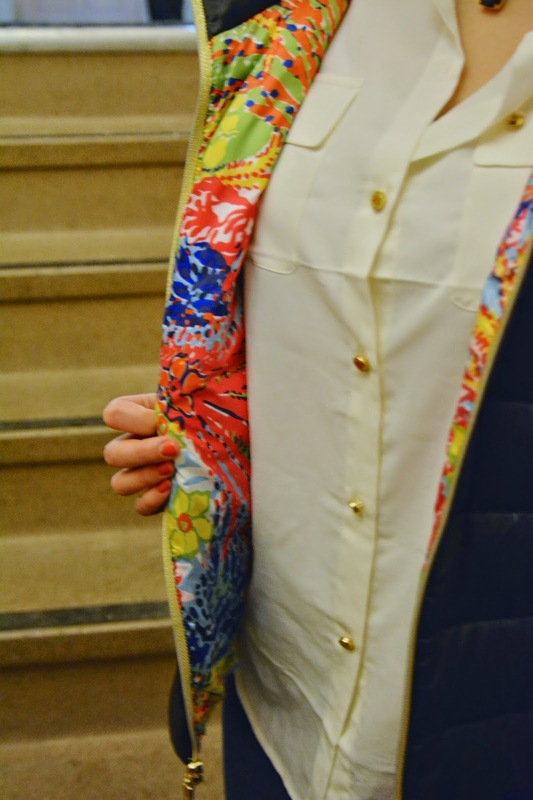 I stopped by my local Lilly store, and fell in love with the Allie Packable Puffer Vest. I have been looking for another puffer vest, and this one is super soft and warm, but also stylish with the gold detailing and colorful print on the inside. 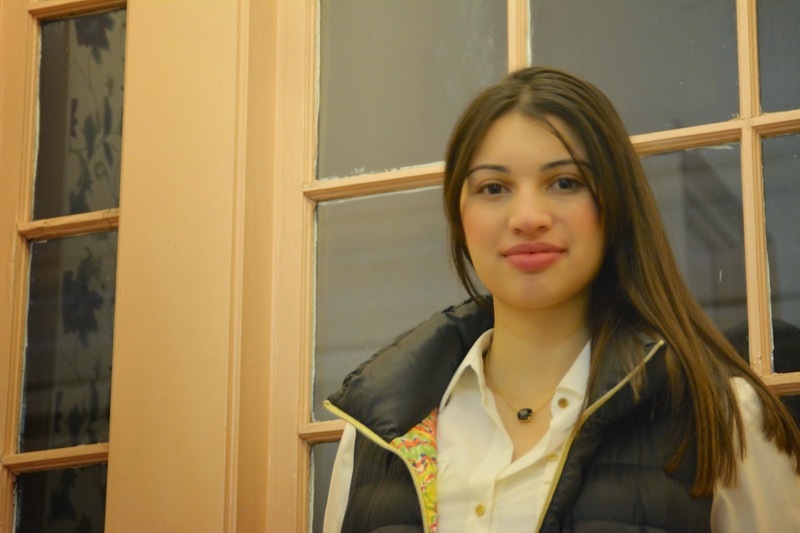 I wore this Juicy Couture chiffon cream button down with gold details to mimic the detailing in the vest. 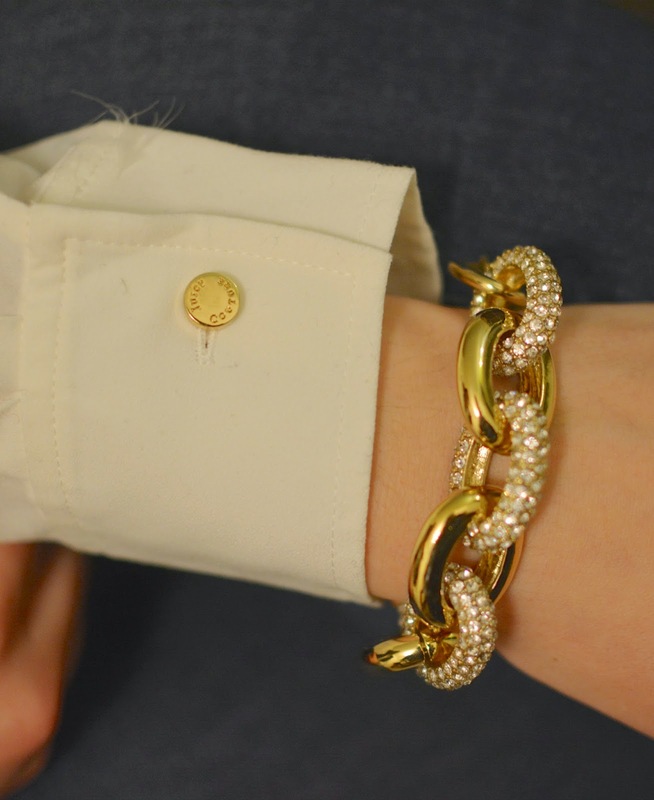 I also paired it with my gold and pave link bracelet from Ann Taylor. 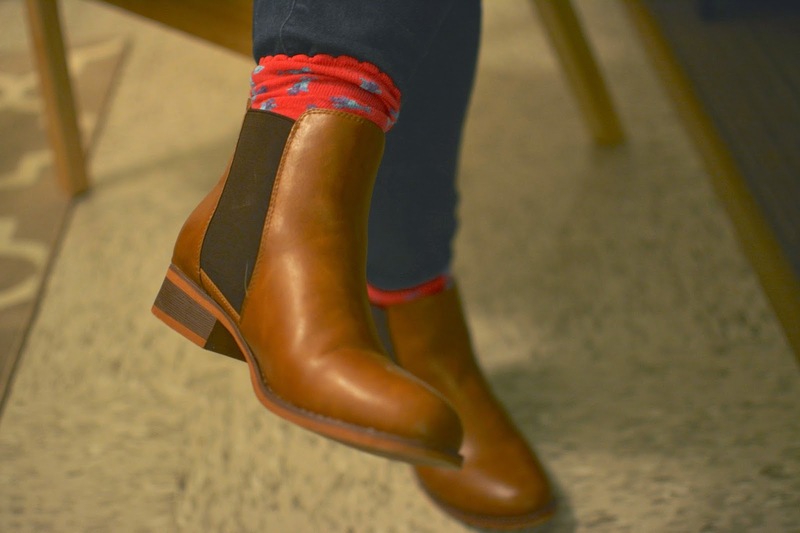 You can't have enough boots, and these cognac colored booties are from Pac Sun. These boots were a steal because the store had a Buy One Get One Free, so I purchased a cardigan and these boots for under $50. I included a pop of color by wearing these fun Betsey Johnson socks underneath. 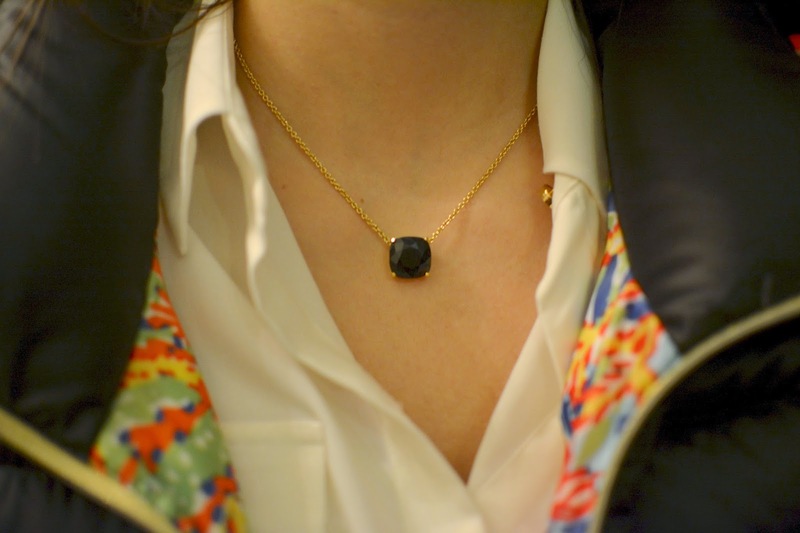 I wore this simple black gumdrop necklace from Kate Spade which has easily become a staple accessory in my wardrobe for how versatile it is. At the end of 2014, Mike and I made a list of things we wanted to do in the upcoming year. 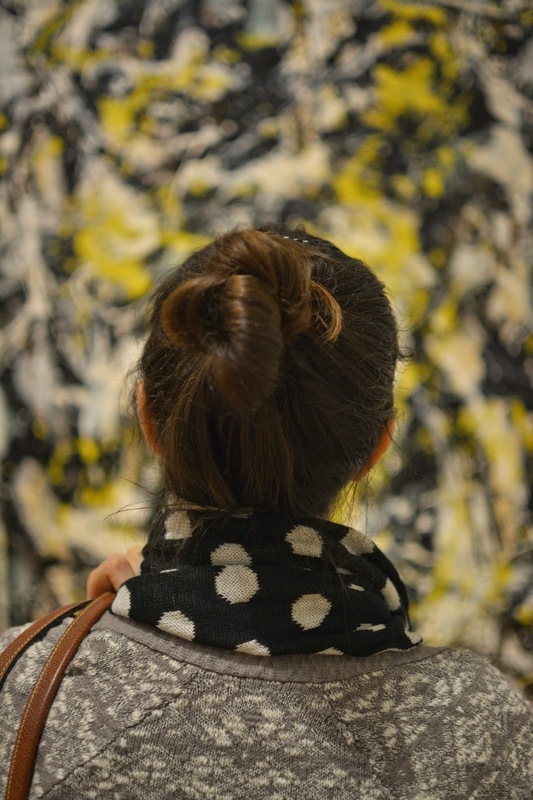 We both wanted to check out the Cleveland Museum of Art since he had never been, and I hadn't been since they had completed renovations. 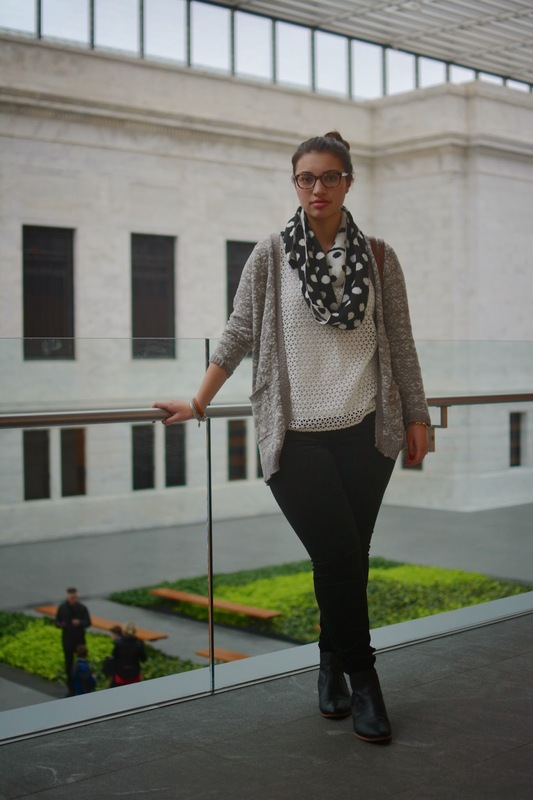 I wore this comfortable yet chic monochromatic outfit. Oversized cardigans and this fun polka dot circle scarf are some of my favorite pieces for winter. This textured laser-cut shirt is from Loft. 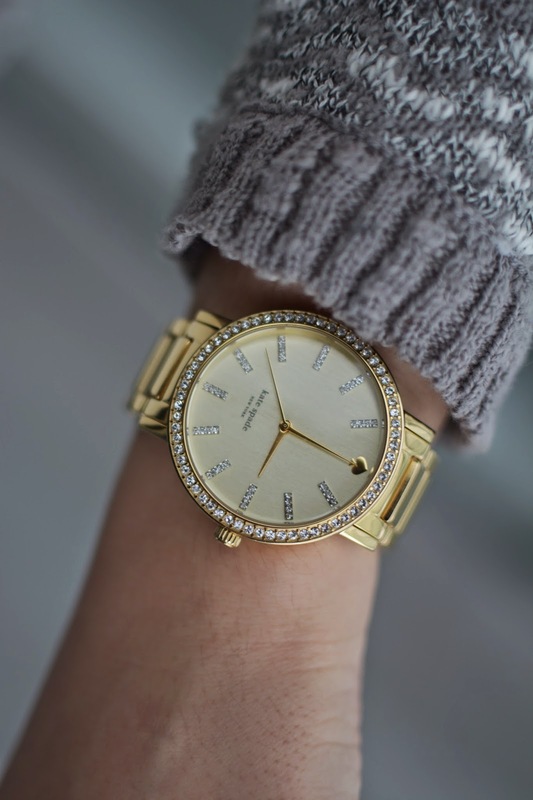 I love the detailing, and it can be easily transitioned into spring and summer. I wore a pop of blue in my bracelets. I love stacking a variety of different styles. These black velour pants are from Francesca's Collections and were on sale for $10! 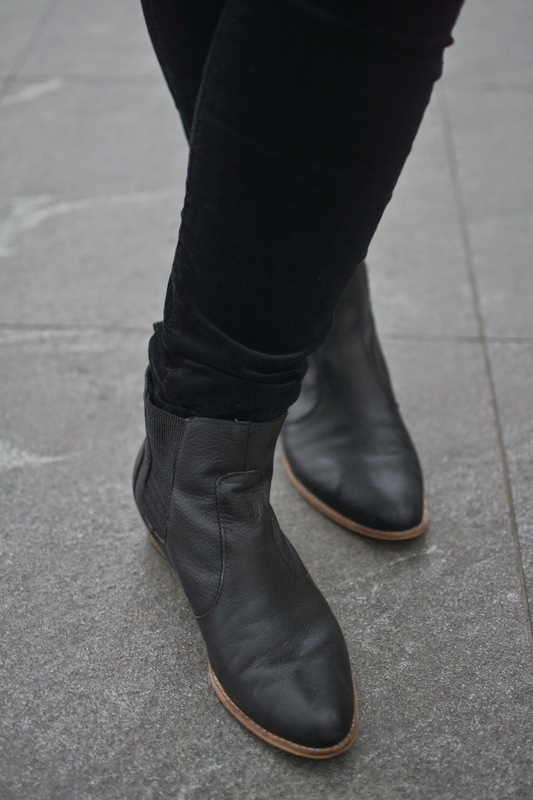 I also wore my black booties from Gap. What's on your bucket list for 2015?